Rock n' Soothe Sleeper - Moxley is rated 4.8 out of 5 by 13. 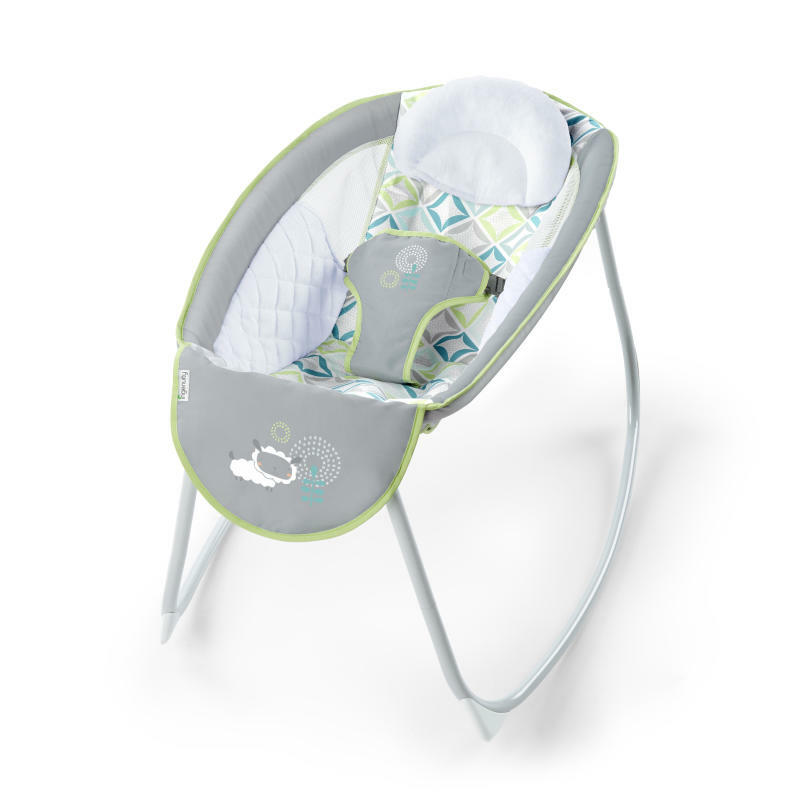 The Rock N Soothe Sleeper gives your little one a safe and relaxing place to rest. Gently rock your baby to sleep after play time, and you too can take a deep breath and relax. Mesh panels make naptime a breeze so your little one can rest easy. Cozy fabrics snuggle up next to baby, while a contoured head rest gives extra support. There’s no need for counting sheep with this sweet and simple sleeper designed by Ingenuity. Dimension (in) 34" x 25.25" x 22.5"
Seat pad - Machine wash with cold water, gentle cycle.Frame – Wipe with soft, clean cloth and mild soap. Rated 5 out of 5 by mcrabb from baby will only sit n this! Love this product.. I tried several other rockers before this one and he really didnt like them. He would move around like they were uncomfortable. Not with this one. He acts just like I am holding him.. love it! Rated 5 out of 5 by Ewebs from Portable and comfy This is a great product for new babies, especially when you have a small house like I do. The rock & play is basically ready to use right out of the box, compact, and very easy to move between rooms (which is a really nice feature when you have a small baby). The material was soft and although baby is not here yet, I'm sure she will enjoy spending time in it. Rated 4 out of 5 by jillwsilver from Great Product This is a great product and helps a lot with having my baby around the house. Just wish it rocked on its own. Rated 5 out of 5 by cait123 from This product is amazing. Perfect size to move from room to room. Great to have the baby nap in during the day while mom is getting things done around the house. Rated 5 out of 5 by cait123 from This product is amazing. This product is amazing. Perfect size to move from room to room. Great to have the baby nap in during the day while mom is getting things done around the house. Rated 5 out of 5 by Raf123 from Beautiful colors! I love the colors of this rocker!! My son sleeps well and it was really easy to put together, thank you! !